I LOVE LOVE LOVE LAMB. But I grew up with a mother who despised it, so the only time I ever got to indulge my desire was on occasions dining out. For that reason, I always associate the meat with special events. Birthdays, graduations, and so on. No more. Today’s dish comes from a thin little cookbook called All-Time Favorite Slim & Healthy Recipes. It’s super easy to prepare and ultra low in sodium. 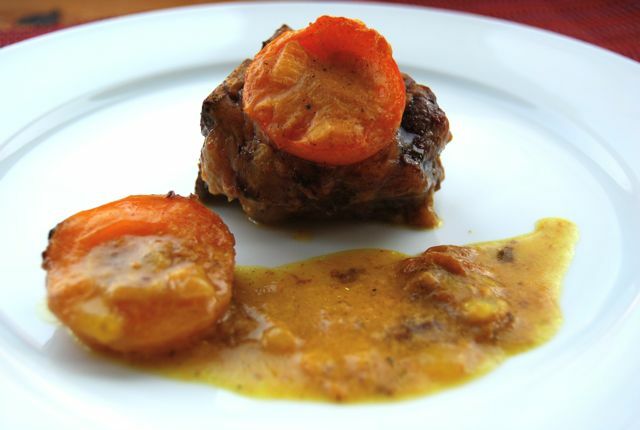 The apricots add a soft sweetness to the flavorful sauce, and if you already like lamb and curry, you are going to LOVE this. I sure do. So much so that I plan on putting it into frequent rotation. Preheat oven to 350 degrees. Get out an oven-safe baking dish and set aside. Lightly oil a skillet and heat over medium-high. Add the lamb chops to the pan and brown well on both sides, about 3 minutes per side. Remove chops from pan and place in a single layer in the baking dish. Top the chops with the apricot halves, and set aside. Pour off fat from the skillet and again place over medium-high heat. Add onion to pan and cook, stirring, 3 minutes. Add broth to pan and stir, trying to get up any brown particles from the bottom of the pan. Measure flour, curry powder, turmeric and black pepper into a small mixing bowl and whisk to combine. Gradually add in the milk, stirring to combine. Slowly add this mixture to the heating chicken broth. Stir continuously until the sauce begins to thicken. Once thickened, let boil 1 minute, then remove from heat and pour over the lamb chops and apricots. Place baking dish on the middle rack in the oven and bake 1 hour. Remove from oven and serve immediately.